For news regarding funerals - please go to the newsletter page of this site. Thank you. Please note that the Funeral today for the late Joseph Kilroy is at 11am NOT at 10am as previously advertised on the parish newsletter. Thanks to all who came to the St Patrick's Celebration on Friday. I think everyone enjoyed themselves, and Tony to the right was in fine form! Thanks also to those who helped to put together a great evening entertainment. 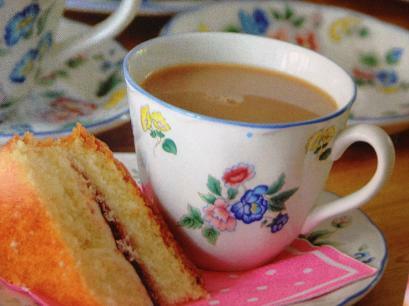 For those who came to the coffee morning on St Patrick's day....what can I say? A fantastic turn out and a real community atmosphere. Thanks Also to those who provided food and helped out with getting the hall ready and the big clean up afterwards! The cost of the Pilgrimage this year is £780 and is an 8 day Pilgrimage (the Diocese is only 7 days, please take this into consideration when comparing price) which includes everything except insurance. For more information Please speak with Fr Jim. The Funeral for the Late Anne Dunne will be on Tuesday 29th January at 10.00am in Church followed by internment at Moston Cemetery at 11:30am. People have asked! So. here is Early Notice of Station Masses for Lent!! It will soon be time to sign up for the Pilgrimage to Lourdes for September this year. Please watch the newsletter for when the information about dates and costings become available. But now is the time to think about whether you would like to come or not. If it has been a while, or if you have never been to Lourdes before, why not think about coming along and joining in this wonderful experience of a pilgrimage crossed with a happy holiday! Advent explained in a couple of minutes! Why not take the time to look at the video opposite. Thanks to all who came to the two Christmas Fair's over the past two days, great crowds arrived at St Malachy's on Saturday, and huge crows turned up again at St Patrick's today, thank you for coming, we would not have a fair without you. Thanks also to the gang of volunteers in both church communities for all the work you do, it is truly much appreciated. I will publish the takings as soon as I have them! to all who came to the quiz night last night. Another most successful evening, and we managed to raise £600 for the Good Life Orphanage! So well done and thanks to all who came and of course all who helped out in ANY WAY! Thanks also to all those who came to the celebrations last Saturday at St Malachy's, it turned into a wonderful evening of entertainment and celebration. I have produced a SPECIAL radio show for Heavens Road FM for Rememberance Sunday this year. Why not tune in on the day and have a listen. This is the link to the station! The film I spoke about in my homily at the weekend is called "Left behind" staring Nichols Cage and was on Chanel 5 on Saturday afternoon. Here is the film, which I found on line. Click on the film (left|), then click on the word YouTube, to watch it full screen. 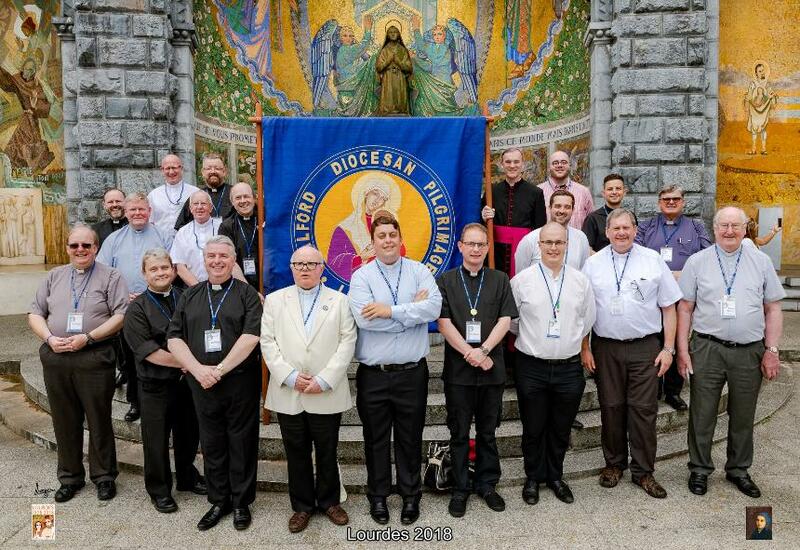 These are the clergy that travelled to Lourdes this year. Why not think about coming to join us in 2019? It is a fantastic week, and everyone has a great time. To see more, please go to the "Parish Pilgrimage" button at the top of this page! But Father what do you do all day? Guide of the juniors, infants and staff with time to be serious, time for a laugh. Parish accountant and administrator; typist and banker, and news duplicator. Digger of gardens, inspector of drains, checker of roofs every time that it rains. Re designer of churches, to fill empty pews, re-glazier of windows, repairer of loos. Visitor, caller, knocker on doors, target of gossips and cadgers and bores. Marshal of servers, collectors and choir; of hymn books and papers - both seller and buyer. President of Eucharist, calm as you like - “but did I remember to switch on the mic! Celebrant of masses, devotions and prayers, patient receiver of everyone’s cares. Marriage encounter and parish renewal; Journeys of Faith and liturgical jewels. Supporter of cafod and Christian Aid, with boxes and envelopes of all shapes and shades, Friend of the Anglicans, Methodists, Jews, Muslems and Buddhists - and everyone’s views. Joint schemes and services, unity prayers, civic occasions and parties and fayers. By bingo enthusiasts and drinkers, he’s seen, as the beginning and end of the social life scene. Drawer of Raffles, Jumble Sales, Stalls - now rushing to Court to re-license the Hall. Minister of marriage, the guide of young love, adviser of couples who need help from above. sport. Looker after of the parish next door, when their priest is sick and down on all fours, worries about wedding preparation and whether he has the right information. Something for everyone you might exclaim, but when things go wrong who is it they blame? he’s never there when I want him! Thanks to all came to the Quiz night last night, 92 people enjoyed the evening and we made £616 for the Good Life Orphanage. Because of the interest shown, I have decided to run a Quiz evening every 3 months. Watch this space for the next one! And he remembers a mother who had an amazing gift of counsel. Here's the advice she gave her son: We all recite the Hail Mary, but how many of us know its true meaning? What is the prayer really saying? In the book, "Mary, Mother of All" ("María, Mamma di tutti"), Pope Francis himself teaches us the meaning of the words of this essential prayer.
."The Lord is with you - What happened in a unique way in the Virgin Mary, Francis says, "happens on a spiritual level in us as well when we welcome the Word of God with a good and sincere heart, and put it into practice. It happens as if God were to become flesh in us; He comes to live in us, because He makes His home in those who love Him and obey His Word. It's not easy to understand this, but, yes, it's easy to feel it in your heart." "Do we think that the incarnation of Jesus is only a past event, that it doesn't affect us personally? Believing in Jesus means offering Him our body, with the same humility and courage as Mary." Blessed are you among women - How did Mary live her faith? "She lived it," the pope answers, "in the simplicity of the many daily occupations and worries of every mom, such as providing food and clothing, and taking care of the house... Precisely this normal existence of the Virgin was the ground on which a singular rapport and profound dialogue between her and God, between her and her Son, developed." Blessed is the fruit of your womb, Jesus. Mary is receptive, but not passive, Francis explains. - "Just as she receives the power of the Holy Spirit at a physical level, but then gives flesh and blood to the Son of God who takes form in Her, so also on a spiritual level, she receives grace and responds to it with faith. For this reason, Saint Augustine says that the Virgin 'conceived in her heart before in her womb.' She conceived faith first, and then the Lord." Pray for us sinners - In order to explain the meaning of this passage of the prayer, Francis relates an anecdote: "I remember how once, at the Shrine of Luján, I was in the confessional, in front of which there was a long line. There was also a young man who was very modern, with earrings, tattoos, all those things... And he had come to tell me what was going on with him. It was a big problem, very difficult. And he said to me, 'I told my mom all of this, and my mom said: Go to the Blessed Virgin and she will tell you what to do.' Now, that's a woman who had the gift of counsel. She didn't know how to solve her son's problem, but she pointed out the right path: go to the Blessed Virgin, and she will tell you. This is the gift of counsel. That humble, simple woman gave her son the best advice. In fact, the young man said to me, 'I looked at the Blessed Virgin and I felt that I should do this, this, and this...' I didn't need to talk; his mom and the young man himself had already said everything. This is the gift of counsel. You moms, who have this gift: ask that it be given to your children. The gift of counseling your children is a gift of God." Now, and at the hour of our death - Let us entrust ourselves to Mary, Pope Francis says, "so that she, as the Mother of our first-born brother, Jesus, can teach us to have the same maternal spirit towards our brothers, with a sincere ability to accept, to forgive, to strengthen, and to infuse confidence and hope. And this is what a mom does." Mary's path towards Heaven began "with that 'yes' she spoke in Nazareth, in reply to the heavenly Messenger who announced to her God's will for her. In reality, that's exactly how it is: every 'yes' to God is a step toward Heaven, toward eternal life." Thanks to all who came to yesterdays fund raiser for the parish coffers, there was a great turn out of over 60 people.. Just over £500 was made, which is a fantastic amount! Thanks to Sr Anne and her team for all the hard work they put in to make the day such a success. Thanks also to those who offered prizes for the draw, on the whole, a most successful and satisfying afternoon! A great walk of witness ensued on Sunday at the Italian Marian walk. The weather was glorious and the crowd was larger than previous years, with thousands looking on. Well done to all helpers and walkers - good day was had by all. If you have not yet seen this video, it is the one they are all talking about. Marcelito has an extraordinary gift, so make sure you watch at least the first 2 minutes of the video to see what happens! 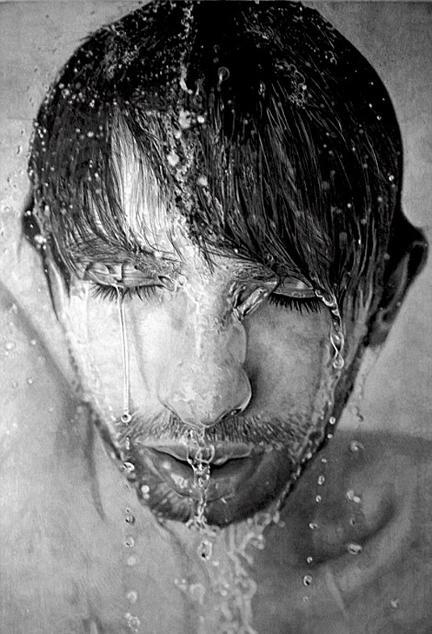 .....it is a pencil drawing! It's amazing the skill and talent of some artists!! A message from yours truly that went out on Easter Sunday morning!! The message from Bishop John that I read to the community of St Malachy's on Easter Sunday morning. This will allow you read it at your leisure. 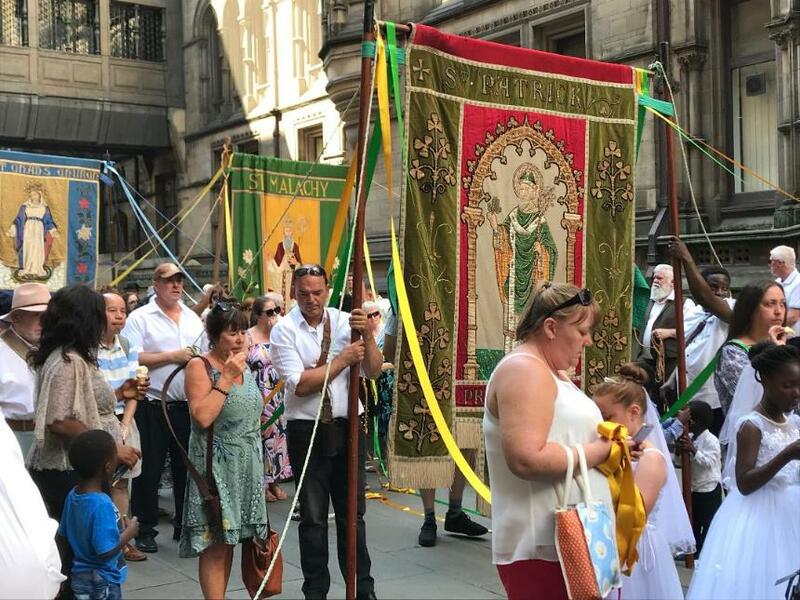 Last summer we agreed a period of experimentation with a new parish Mass schedule in the hope that we might avoid the closure of St Malachy’s church. I am very grateful to all those who have assisted the celebration of the Saturday evening Mass. I write now to tell you that, at least for the foreseeable future, I am pleased to confirm that the Saturday evening Mass will continue. However, it is important that everything that takes place at St Malachy’s needs to done in collaboration with St Patrick’s, the Parish Church, and with the approval of Fr Jim the Parish Priest. It is equally important that the whole parish begins to engage in our pastoral initiative “Hope in the Future”, inviting individuals to take responsibilities that will develop ministries and allow Fr Jim to carry out the pastoral and sacramental ministry, free of additional administration. There is much that members of the community can undertake, both in administration and in pastoral ministry, and we must develop these responsibilities as we grow as “mission parishes”. I am particularly grateful to the members of the community who have taken a lead role in the “Hope in the Future programme” at St Malachy’s and I would ask you to assist them in developing the pastoral ministry. In the near future a major housing development is due to take place in Collyhurst and you will have the opportunity of welcoming newcomers. I hope that you can see this time as a privileged moment of preparation for your “mission”. The Good Life Orphanage are Celebrating 10 wonderful years! 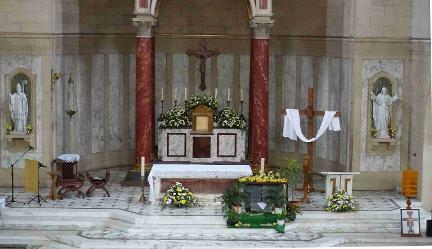 Friday this week, the morning mass is replaced by a Requiem Mass at 12 noon. Saturday's morning Mass is cancelled. Thank you top all who helped out in any way with getting the church ready for the Triduum, the place looks amazing! I hope that all who attended the services found them to be moving, and spiritually uplifting. A lot of work goes into Easter week and I am grateful for all that happens with the input of the Sisters and the parishioners. It would not be possible to do what we do without the co-operation of so many. Blessings on you all, and may the Risen Lord inspire us to keep the faith and carry the cross! Thanks to Sr. Anne ands her team! Thanks to Sr Regina and her team over at St Malachy''s. The Sanctuary is beautiful! May God Bless us all in this Holy Season! On behalf of Fr Peter and myself, we would like to extent to you and your families, every blessing of this most Holy Season. We pray that the Risen Lord will continue to be your inspiration, and may the Joy of Easter strengthen your faith both now and for ever. We have made the front page of the Diocesan web site! Please come and support this important Mass , and do a little extra for Lent! This is to raise funds for the Good Life Orphanage in Kenya. If you can, please come and join us for some home made soup Each Friday in Lent (except Good Friday) from 12 noon until 1:30pm. This is a chance to socialise as a parish community and is wa welcome distraction to the mad world we live in. Please come if you are able to come!! Parish Pod Cast - number Two! This is a new venture, and a new way to get news and events out to people in the parishes as well as anyone who happens to pass by the web site. In October representatives from all parishes in the diocese met at the cathedral with Bishop John, to launch the programme Hope in the future. Each parish received this beautifully framed Icon of the Saint Damiano Cross, Cath Jones received it on behalf of St. Malachy's and it now stands in front of our lectern. Saint Francis was praying in front of the Saint Damiano Cross when he received a commission from the Lord, to rebuild the Church. Not with bricks and mortar but to rebuild the Church spiritually and make its strong and steadfast. Missionary parish, what could it mean in practical terms? How we as a parish can work together to support Fr. Jim in his mystery as our parish priests, and help to strengthen and develop the good work which is already underway, for example, the work of the presentation sisters, the Brothers of Charity, St. Malachy’s school and the Lalley centre. A small group of parishioners met to discuss/ think about how we could get this initiative underway here at St. Malachy’s. The first thing we need is help, your help and ideas, so how can you as a family/ individual continue to support the growth and the development of the parish? If you are good at odd jobs, or DIY. If you could help with church cleaning. If you would like to be a reader or take up the offertory. If you can help out in any other way that hasn’t been mentioned, we would like to hear from you. Please do think about what has been said through the coming week. Next week there will be paper and pencils available for you to jot down what you would like to help us with. If you feel you cannot help physically, you can still help by praying for the success of Hope in the future. Stay with us lord on our journey. CARITAS Sunday will be on the 28th January, and there will be a retiring collection that day for all the work they do. Mass that day will be focusing on some of the work carried out by CARITAS, they do great work, and are your voice working in the community. Want to know more about the Gospel of Mark? Fr Christopher Lough will lead an introduction to this earliest and shortest of the Gospels, outlining some of the main themes and ideas to look out for over the coming weeks and months. There will also be an opportunity to work in a relaxed way with some of the stories that Mark sets before us. On Monday 22nd January 2018 at St Anne’s Parish Hall, 1537 Ashton Old Road, Higher Openshaw, Manchester M11 1GR from 7.30 to 9.00 pm. All welcome. Refreshments available from 7.00 pm. There is no charge for the evening. Ample parking. Bus 219 stops at the door. For times of services and masses over the Christmas weekend and for Christmas Day, please see the newsletter page. All the information you require is there! 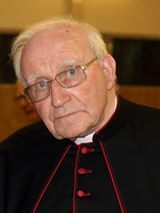 It is with sadness that the Diocese announces the death of Canon Eugene Dolan, who went home to the Lord at 8pm on 7th December. Eugene died peacefully at home in Derry. 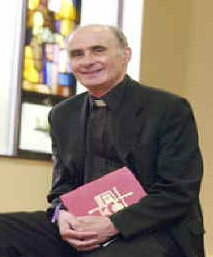 He had been priest at St Edward's, Lees in Oldham since 1970 and Parish Priest there since 1974. We extend our sympathy to his family, his friends and of course to his extended family of the parishioners of St Edward's. Thanks to all who helped out in any way with the fair last Sunday, the total was a staggering £1768.00, well done to everyone involved. The total made on Sunday was £1570, which is a wonderful amount, considering we have the raffle to come in on top of this. Let's have a last push to sell as many tickets for the raffle as we can. Thanks to everyone who helped out on the day and also thanks to those who came along, it was great to see such a huge crowd. Mistake on this weeks printed newsletter! Mass this Sunday is back to the usual time of 9:30am and 11:30am, I forgot to change the details from last week. I do appologise for any misunderstanding. The funeral details for the late James John Kennedy are – a service at Blackly Crematorium on Tuesday 21st November at 1pm. Our congratulations go to Marion & John Dalton, on their 60th Wedding anniversary. What an achievement, and what a wonderful example to the young. May God continue to bless them in their married life together. 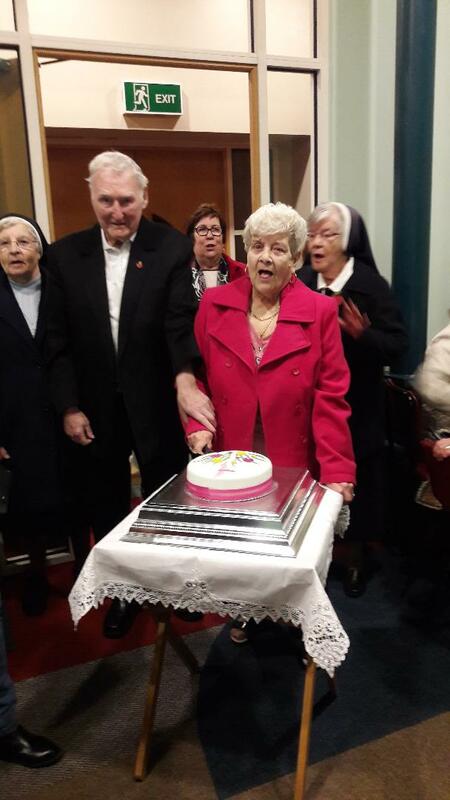 The photograph shows them cutting the cake in St Bridget's room, as part of the community celebration of their anniversary. The Old Boy's will be joining us for Mass next Sunday (19th November), where we remember all those past students of St Patrick's who have been taken home by the Lord. We welcome the Association, and pray for all their members, living and deceased. You are invited to a series of talks for Advent! What can a penniless foreign widow, an elderly barren woman and a young Virgin mother tell us today about welcoming Jesus, God-with-us? Format: Prayer and Lectio Divina; reflection on Scripture passages and their relevance for today; discussion. For those who may be interested, below is a letter from the Bishops Conference of England & Wales, and the use of the Bread and Wine for the liturgy. The Bishop has recently announced that the following parishes will be amalgamated. These changes have come into effect immediately. St Christopher, Ashton, and St Mary of the Angels, Ashton will form the new parish of Holy Cross and St Helen, Ashton under Lyne. St Mary’s, Levenshulme, and St Richard, Longsight will form the new parish of St Robert of Newminster. St Willibrord, Clayton, and St Anne and St Bridgid, Ancoats and Bradford will form the new parish of The Holy Spirit, Manchester. St Anne, Accrington, and St Joseph, Accrington will form the new parish of St Anne and St Joseph, Accrington. St John the Evangelist, Bromley Cross, St Brendan, Harwood, and St Columba, Tonge Moor will form the new parish of Corpus Christi, Bolton. Many of these parishes have been working together for a number of years. We offer our prayers to the new parishes as they come together as a community in worship and to build strong missionary parishes. 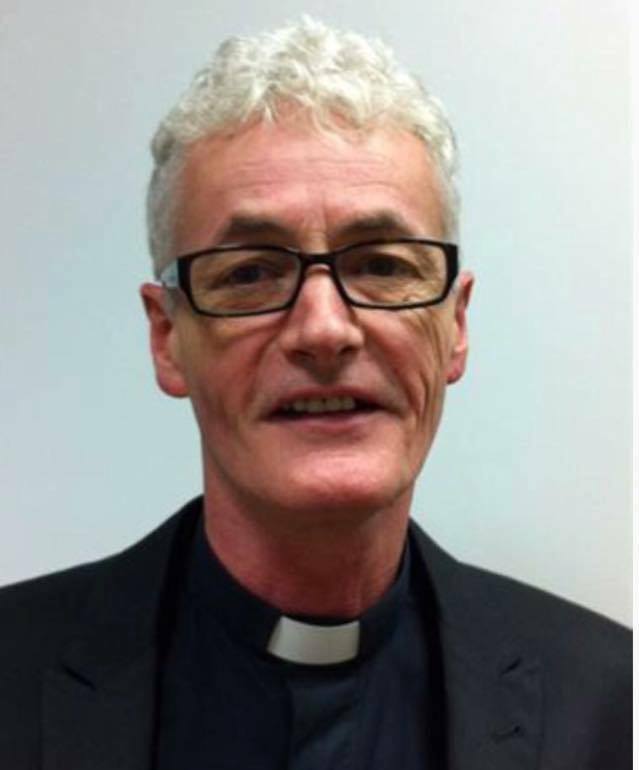 Sadly, the Diocese announces the death of Canon Kevin O'Connor, who died peacefully today (24.10.17) in North Manchester General Hospital. 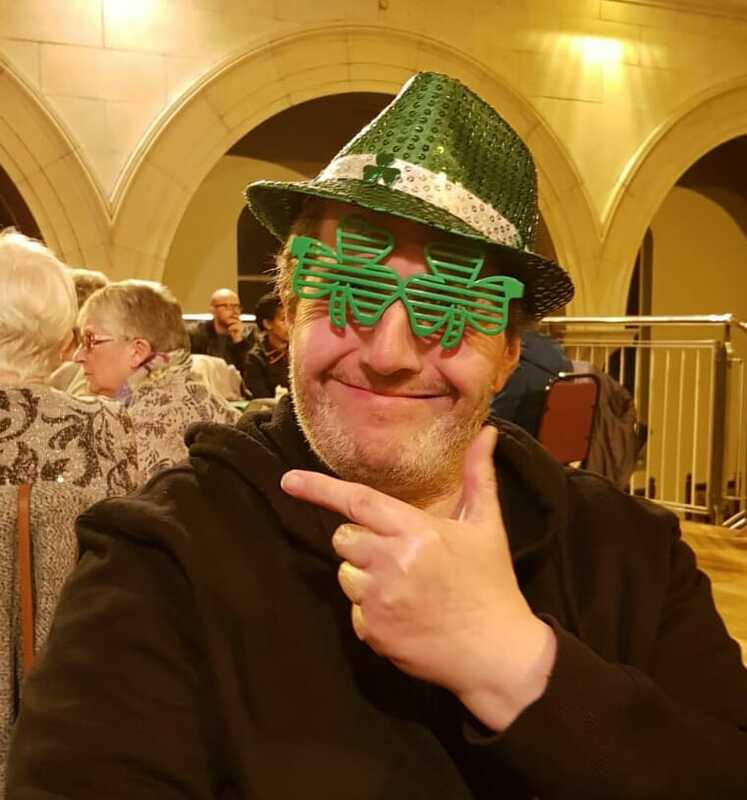 In your charity please pray for his eternal soul, as well as the members of his family, and the community of St Margaret Mary's in New Moston, where Kevin had served for many years. The picture to the immediate right was taken at Kevin s 60th Priestly Anniversary Celebrations. Kevin was huge into music and conducted the choir for the visit of John Paul II in 1982 in Heaton Park, something he was very proud of. A huge personality who will be sadly missed. Thanks to all those people who have dropped into the web site for a look, there have been over 300 in the past week; I am delighted with the numbers. I hope that you are finding it useful, but if there is anything you would like to see on the site, please drop me an email and I will see what I can do to include your idea. Had a meeting last night regarding the next stage in the HOPE IN THE FUTURE programme. The next thing to happen will be an initial meeting for those who have shown interest. The date for the meeting will be on this weeks newsletter, for all those interested, please special note of the time and date and please try to attend. 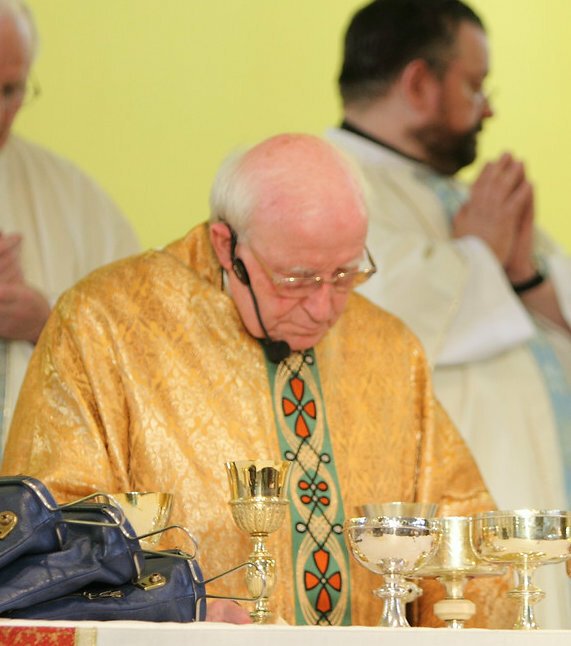 Please pray for the repose of the soul of Fr. Michael Fleming who so sadly passed away during the week. Michael was at Seminary with me and was a good friend. He will be sadly missed by so many people. His body will be received into Holy Rosary Church Oldham on Wednesday 25th October at 7pm, with concelebrated Mass. His requiem will take place on Thursday 26th October at 11am, celebrated by Bishop John and priests of the diocese. He will then be intered in Wardley Cemetery. Cathy Fitzpatrick's report on the opening of "Hope in The Future"
Wednesday 4th October – Call to the Cathedral for the launch of the programme “Hope in The Future”. On Wednesday night I, along with Father Jim and parishioners from St Patrick’s and St Malachy’s churches went to the cathedral for the launch of the Bishop’s new Programme, “Hope in The Future”. Each church was presented with a display of St. Damion’s Cross – St Damiano. This is the cross that St Francis used in his daily prayer. While he was at prayer one day, he received the message from God to rebuild my Church. Realising sometime after, the message was much bigger than simply building churches, it was about the building up of faith, witness and people, and to bring new energy and spirit into the universal Church. This was the birth of the Franciscan spirit, and Francis spent the last twenty years of his life spreading the message of simplicity, prayer, poverty, kindness, fraternity and community. throughout the world. No wonder our present pontiff chose the name “Francis". It is this same spirit we wish to nurture in our own Diocese of Salford, so that we can rebuild our churches, not with bricks and mortar, but with faith, prayer and charity. The “Hope in the future” programme is a challenge to build on the good work already being accomplished in all our parishes. 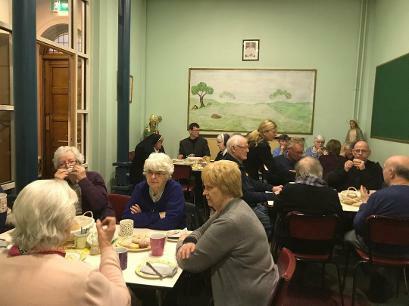 The programme is very much, building upon what we already have, serving the particular needs of the local community, reaching out to parishioners who do not regularly attend church, and caring for our own local community. “Hope in the future” is inspired by the teachings of Pope Francis in developing a missionary parish. To achieve this, I am asking for volunteers to help form a parish team – this is an invitation to set out on a journey with the Lord, as a missionary disciple, as Fr. Jim and our other diocesan priests cannot do this on their own. We would like you to volunteer. See Either Cathy Fitzpatrick or Fr Jim. The first steps, once we have a team in place, is to meet together, may be a few times before Christmas, and each meeting will be no more than an hour in length. Members of the Parish Team, must see their roll as partners with the Parish Priest, working closely together for the good of the whole parish. The parish team will keep everyone informed through the newsletter. Where: St. Sebastian’s Community Centre. Dates: October - 16th, 23rd and 30th. November - 6th, 13th, 20th. Songs that hold meaning for me. Prayer and my lived experience. Living in our world with a sense wonder. Sessions are a mix of input, conversation and reflection. The atmosphere aims to be relaxing, reflective and conversational. We are all on a journey. When we journey together we support each other and learn from each other. Anyone who is Open to LISTENING, to LEARNING, and to SHARING will enjoy and benefit from these sessions. If you wish to attend some or all of the Conversations please ring or text Theresa Davis at 07 415 713 274. I have just received the information below. If this affects you, or you know someone who might like to attend, please pass on this information. Thank you. Names are read out, candles lit and prayers said in memory of those whom we love but see no more. a national network who offer support and help for families and friends bereaved through homicide. We have been asked to circulate to parishes a survey on Modern Slavery. Full details can be found in the Letter from Bishop Patrick Lynch and the Santa Marta Group. In 2016, Pope Francis called Modern Slavery a ‘true crime against humanity’ and urged the Catholic Church to assist in the fight to eliminate it. The eradication of Modern Slavery was included in the United Nations Sustainable Development goals in 2015. As a Church we are in a privileged position as many of those exploited look to the church and come to the Church for help. In this survey we are asking you to help us identify these vulnerable communities – who they are, where they are, what they need, and what you need to support them effectively. The purpose of the survey is to understand the awareness level of Modern Day Slavery / Human Trafficking and to decide the best form of action to prevent it. The deadline is 16th October. 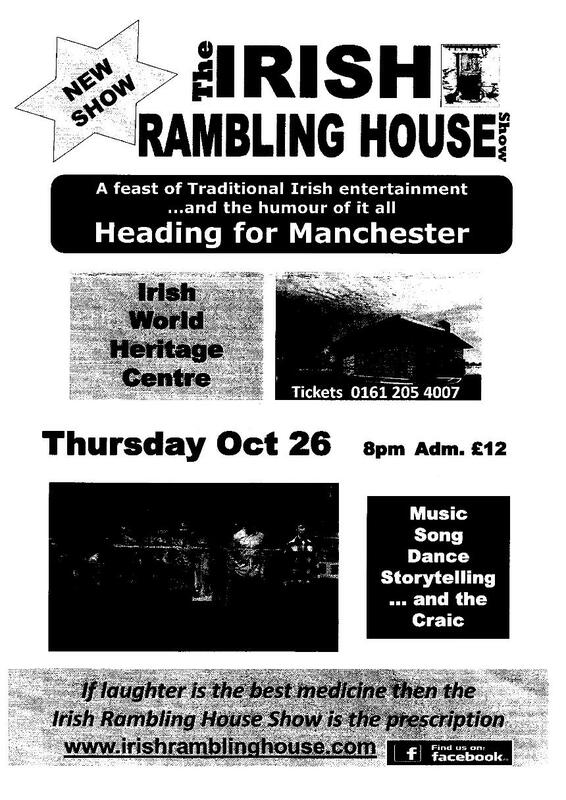 Just received news that The Irish Rambling House Show is coming to the Irish Centre. See below. Bishop John's pastoral letter, read by himself in video form. He speaks about the new initiative "Hope in the future". Please listen to what he has to say, and if you feel you are able to help out in any way in the parish, please come and see me soon, so we can discuss how you might be able to engage in the life of OUR parish. Planning for your Catholic Funeral!! This might seem a bit weird , but there is a Catholic web site that will help you plan for your funeral. I feel it is important that you leave instructions in your will as to what you require for your funeral. Many families who have children who have not attended mass for many years, will sometimes hold inappropriate services for parents who have been life long mass attendees. See - http://www.artofdyingwell.org/catholic-funeral-planning-checklist/ which may well help you with the details of what you really want to happen when the time comes for your funeral to be arranged. There is also information on the site with dealing with bereavement, which may help those who are left behind, dealing with emotional turmoil.